A stunning look doesn’t get much stunning than when you top it off with our ties in stunning blue. Especially when you consider this shade with our Handsome Paisley Pattern. 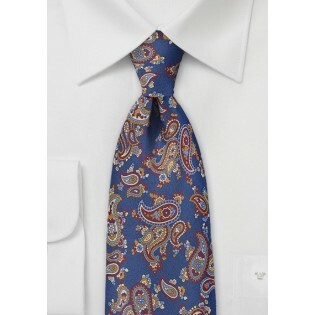 This necktie takes the cake for originality, and can help put your outfit ahead of the fashion curve. The exciting base color looks incredible against the shades found in the pattern, including bold maroon, ocher, gold and pale blue. 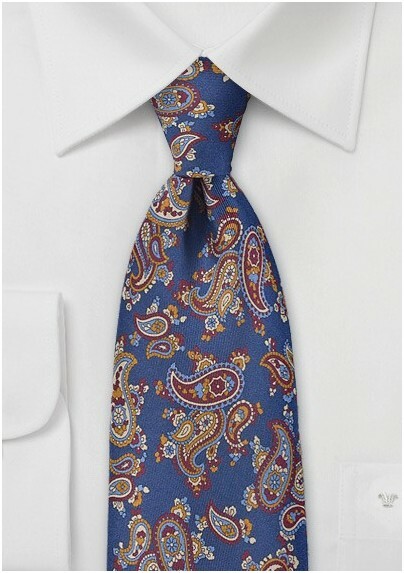 We’d wear this tie under a sweater or cardigan, or on it’s own with a press button-up. This necktie is made of 100% silk.